After fighting for several years against the Trojans, Ajax went mad. He was infuriated because Agamemnon and Menelaus gave the armor of Achilles to Odysseus instead of to him. One night he prowled the camp intent on killing the three men, but Athena cast a spell on him. She deluded him into thinking that the livestock in a nearby pen were his intended victims. The next morning, finding a host of slaughtered animals at his feet, he resolved to fall on his sword. 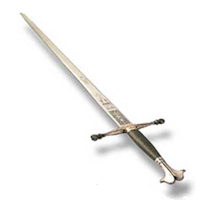 The sword was a gift from the Trojan prince Hektor. Ajax received it from him after the two spent a whole day fighting one another. Homer tells the story in Book VII of the Iliad. One morning, Hektor and his brother Paris fiercely attacked the Greek army, killing so many warriors that Athena and Apollo decided to call a halt to the fighting. They put the idea in Hektor's mind to challenge the Greeks to choose just one man to fight him in single combat. With some encouragement from Nestor, nine men volunteered. To the delight of the Greeks, the lot fell to Ajax. The heroes fought without killing one another until dark, when their comrades decided to break it up. As they quit the field, Hektor proposed an exchange of gifts. He gave Ajax his silver studded sword. Ajax gave him his bright red belt. In the end, both gifts brought humiliation. Achilles used Ajax's belt to lash Hektor's dead body to his chariot as he dragged it around the tomb of Patroclus. Ajax used Hektor's sword to kill the livestock. When they discovered what Ajax did, his men and his slave-wife Tecmessa became worried about him, especially as he was leaving the tent with sword in hand. He reassured them that he had learned his lesson and intended to bury the sword. He did bury the sword: hilt down, blade up. After performing the Greek equivalent of the last rites over himself, he threw himself on it. When his half-brother Teucer disimpaled him from the gleaming spike, he asked the dead Ajax if he saw how Hektor managed to destroy him even from the grave. The sword, he said, must have been forged by a Fury. 1 Sophocles, Ajax, line 665. Sir Richard Jebb (1893) translation.